Ecosystem Marketplace is putting out a last call for project developers to include their projects in the State of Watershed Payments 2012 report. Meanwhile Volkswagen has implemented a successful groundwater replenishment project in Mexico and Ecotrust released a study claiming ecological restoration can boost the economy. This article originally appeared in the Water Log newsletter. Click here to read the original. 29 September 2012 | Greetings, Water Loggers! We’ll call this the month of silver linings. This Water Log is full of pleasant surprises appearing in the midst of bad news. A new GEF report tracks water scarcity worldwide – but also gleans some useful lessons on how science can counter it. In many places, the economy continues to sputter along – but an Ecotrust study shows us that ecological restoration projects can be an economic bright spot. And while the US has been hit with the worst drought in 50 years, farmers are finding unexpected opportunities to market nutrient credits as a result. We summarize all these stories below. We’ve also got lots of news on water quality trading, a successful groundwater replenishment project from Volkswagen in Mexico, a just-released guide to corporate water disclosure, and much more. Here at Ecosystem Marketplace, we’re busy on our upcoming State of Watershed Payments 2012 report, which is shaping up to be our most comprehensive catalog to date of payments for watershed services, water quality trading, and environmental water market programs. The report will track impacts, transaction values, and trends in program design worldwide. We are committed to providing this valuable information free-of-charge, and for that reason we rely on sponsors to help us bring this information to the public. We’re currently building a coalition of sponsors for the report. Click here to learn how your organization can be part of the report. We’re also putting out a last call for project developers to be included in the upcoming report. If you’re working on a restoration or protection project that uses innovative financing to connect watershed stewards and beneficiaries, we want to hear from you. Send us an email or fill out our survey. And finally, we’re hiring! Ecosystem Marketplace is seeking a manager for our Latin American program. Read the description below or learn more here. The Global Environment Facility (GEF), the largest public funder of projects to improve the global environment and promote sustainable development, partnered with the United Nations University and the United Nations Environment Programme (UNEP) to extract lessons from a portfolio of major transboundary water projects involving investments of more than US$7 billion. The results from that study, being published this week in Bangkok, identify major challenges to the world’s groundwater, rivers, lakes, oceans and land-based pollution sources. Captured also in the new report, Science-Policy Bridges over Troubled Waters, are some proven science-backed solutions, synthesized from five GEF International Water Science Working Groups. – Learn more at Ecosystem Marketplace. As the Clean Water Act (CWA) nears its 40th anniversary, legal argument over its scope continues to frustrate regulators and regulated alike, getting in the way of effective water protection as well as emerging water quality trading and wetlands mitigation. At issue is the jurisdiction of the CWA. That is, which waters are subject to federal permitting requirements and technology-based water quality standards, and which are subject only to state or local water regulation. Recently, a panel at the Clean Water Act Law and Regulation conference tackled the issue. – Ecosystem Marketplace has the story. From the day it was founded in 1905, the US Forest Service has been torn between two mandates – the philosophy of founding USFS Chief Gifford Pinchot, to conserve forests primarily for the natural resources found there, and that of Sierra Club founder John Muir: to preserve forests for their inherent beauty and recreation. That rift is apparent in the Forest Service’s recent efforts to craft a new Forest Planning Rule that manages forest for multiple uses, including outdoor recreation, range, timber, watershed, and habitat values. Last month, several organizations led by the Public Lands Council and the National Cattlemen’s Beef Association filed a lawsuit arguing that the new rule and its “unlawful establishment of ecological sustainability as overriding objective of national forest management” violates a number of statutes. If the lawsuit is upheld in court, national forest management will revert to the previous planning rule. But proponents of the new rule says it actually reflects a return to the Forest Service’s real mandate. “There is a good argument that the new rule actually corrects an imbalance in the past, whereby a variety of ecosystem services that were required to be considered by the “multiple use ” language, were excluded from the planning process, ” says Blake Hudson, an environmental law professor from Louisiana State University. Nearly 1 billion tons of carbon dioxide are released into the atmosphere annually due to the continued destruction of coastal ecosystems, according to a recent report. Estimating Global ‘Blue Carbon’ Emissions from Conversion and Degradation of Vegetated Coastal Ecosystems was published this month by Duke University and examines the global and economic impacts of the loss of coastal-marine ecosystems that stored immense amounts of carbon. It finds that these devastated ecosystems caused $US 6-42 billion in economic damages and the emissions they released is equal to 3-19% of the emissions that comes from deforestation globally. “Up until this study, people didn’t realize how big of a potential emissions source blue carbon destruction – and the destruction of these coastal marine ecosystems – was, ” says Duke University Research Professor and Director of Economic Analysis Brian Murray. Scores of water-quality trading programs are under development across the United States, but few have reached the operational stage and most are limited to parts of watersheds within specific jurisdictions. The United States Department of Agriculture (USDA) is changing that with targeted funding for programs that develop market-infrastructure and a support network that became operational this month. Late in August, the agency’s Natural Resources Conservation Service (NRCS) announced that it had awarded $7,083,596 in grants, with $2,350,686 going to the Chesapeake Bay and $4,732,910 spread across the rest of the country. We can’t wait to see what the awardees come up with. – Learn more about the CIG grant awards here. New data from Ecotrust demonstrates how watershed and fish habitat restoration in Oregon are good news for a local economy. Ecotrust found that restoration projects generated $977.5 million in economic activity and as many as 6,483 jobs between 2001 and 2010. Restoration projects create jobs, demand for local businesses, and deliver long-term economic benefits too: habitat improvements intended to bolster fish runs promise to increase sport and commercial fishing opportunities in the coming years– already big business in Oregon. – Read more and download the report. Companies are increasingly aware of their water use and looking for ways to use water more sustainably – but corporate water management is very complex and guidelines for clear and accurate disclosure are few and far between. A draft of The CEO Water Mandate’s Corporate Water Disclosure Guidelines was released last month, offering firms a framework for disclosing their current water use and impacts, implications, and planned response. The CEO Water Mandate is led by the Pacific Institute with input by organizations with expertise in water related issues. Input solicited from companies using the guidelines will inform a future revised version. – Read the report here (pdf). From climate regulation and storm protection to the shipping, fishing and tourism industries, the blue world-Earth’s coastal and marine ecosystems contribute to human well-being in so many ways. A new UNEP report, Green Economy in a Blue World, analyzes risks and opportunities in these interlinked sectors for creating a healthier and more economically productive blue world. The report offers a discussion of threats like climate change, overfishing, pollution and other sources of degradation, and how investments in marine ecosystems can promote human well-being, social equity and economic opportunity. – Learn more and read the report. This month the International Union for the Conservation of Nature (IUCN) launched its new tool to track the health of ecosystems. Based on an agreed on international criteria, the Red List of Ecosystems confers ‘vulnerable’, ‘endangered’ or ‘critically endangered’ labels on ecosystems. Ulimately to correspond with IUCN Red List of Endangered Species, the List’s evaluation of risks and potential loss of ecosystem services can help guide conservation action. ““We envision that it could become a one-stop shop for economists, rural communities, local and national authorities, who can use the assessments of the Red List of Ecosystems to better manage the finite resources of our planet,” said Edmund Barrow, who heads the IUCN Ecosystem Management. IUCN is also planning to introduce the Green List of Well-Managed Protected Areas at the IUCN World Parks Congress in 2014. The Green List will reward innovation, excellence and enterprise by supporting governments and their conservation partners. The Global Water Partnership recently appointed a new chair, Ursula Schaefer-Preuss. Schaefer-Preuss is an economist who’s been involved in development policy for over 35 years and whose prior positions include Vice President of the Asian Development Bank in Manilla for Management and Sustainable Development.“The work of the GWP network deserves the highest level of attention during these times of growing concerns with the many and intertwined challenges of climate change, urbanization and the water-food-energy nexus,” says Schaefer-Preuss. – Read a press release here. Globally, there are 276 water basins shared by two or more countries – and about 40% of the world’s population lives in one of these basins. So when the WWF saw their conservation goals go unfulfilled because of countries’ unwillingness to cooperate over water resources, they decided to pour their support into the UN Watercourse Convention, a set of principles for negotiating international water agreements. The Watercourse Convention was first created fifteen years ago, but failed to elicit much enthusiasm by governments for endorsement. But now with WWF acting as lobbyist, the treaty is just eight countries short of the 35 needed for it to be implemented within ratifying countries. The convention will enforce such principles as notifying a basin partner of water projects and giving them a chance to respond. Officials say while the convention was lost in the 1990s ‘treaty frenzy’ surrounding the Kyoto Protocol and Rio Declaration, it’s on a clear path now. 27 countries have completed the ratification process and five more – the United Kingdom, Ireland, Italy, Niger and Senegal – are moving in that direction. Environmental Leader ran an update earlier this month on a Volkswagen-funded reforestation project that through increased groundwater replenishment is more than offsetting the automaker’s plant’s water use. About 750 hectares have been planted with native trees, delivering an estimated 2.5 million cubic meters’ worth of groundwater recharge annually. The National Commission of Protected Areas (Comision Nacional de í¡reas Naturales Protegidas) and the National University of Mexico are partners. – Read more at Environmental Leader. In 2010, New York state put a temporary halt to hydraulic fracturing (“fracking”) until regulators completed a review of risks and how they might be managed – if at all. A decision was promised by the end of this summer, and then pushed back to September pending a study of fracking’s impacts on health. The delay has both the fracking industry and its opponents on the edges of their seats. The Marcellus Shale formation underlying part of the state might hold a natural gas bonanza – but fracking has long been vehemently opposed by many communities concerned about drinking water contamination and other hazards. In New York, the fracking-versus-drinking-water debate takes on especial salience: a large piece of the state is protected as the source of New York City’s water supply, with the city having spent more than a billion dollars in the past fifteen years to ensure the pristineness of its watershed. Governor Andrew Cuomo has already indicated that fracking would certainly be banned in the NYC watershed area – as a recent report notes, contamination in the watershed would cost a minimum of $6 billion in new water treatment costs – but other municipalities in the state have asked why this same consideration wouldn’t apply to them too. If the state doesn’t decide by November, it would likely have to reopen a public comment period. And even if New York unequivocally bans the practice, its residents aren’t free from risk – parts of the state located in the Susquehanna River basin are downstream from fracking activity in neighboring Pennsylvania, much to the chagrin of some New Yorkers. – Read more at BusinessWeek. A new blog post at CGIAR’s Challenge Program on Water and Food (CPWF) blog muses on one critical hurdle to designing effective benefit-sharing mechanisms: achieving hydro-literacy in communities involved in negotiations. One model, Project AN3, has developed a successful facilitation framework in the Andes, “conservatorios,” that lets stakeholders to assess their options for sharing benefits from river basin management and decide how to partner on implementation. Slides from a recent presentation at Stockholm World Water Week on facilitating hydro-literacy are included and well worth a look. – Learn more at the CPWF blog. Santa Rosa, California is getting in on the water quality trading action: the Sotoyome Resource Conservation District just got a $600,000 grant to develop the state’s first nutrient trading program. The city plans to buy credits to offset its wastewater treatment plant’s discharges to the Laguna de Santa Rosa watershed. The District is working with Kieser & Associates on projects reducing sediment loads into creeks at a local nature preserve and managing animal waste at a dairy in order to target nutrient pollution. Additional projects are being sought out. – Learn more at the Press Democrat. SABMiller’s Water Futures Partnership has been having a busy few months. The partnership, which includes SABMiller, the WWF, and GIZ announced that it will launch a new watershed protection project in Ndola, Zambia, aiming to work with the community to protect springwaters that SABMiller subsidiary Zambian Breweries relies on in its operations. 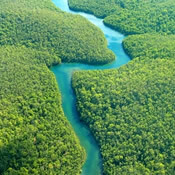 The partnership also has announced that Coca-Cola plans to join the group, which will be rebranded as the Water Futures Initiative and expand its activities to Colombia, Honduras, India, and the US, focusing on projects that deliver water security. The partnership is already active in South Africa, India, Peru, and Tanzania. The new initiative will seek additional members from the corporate, public, and nonprofit sectors. – Learn more at Environmental Leader. Looks like the massive drought that’s hit the US this year might have one silver lining: lower agricultural yields mean that farmers might be eligible for nturient credits next year. “Substantially lower yields experienced this year can lead to less removal of nutrients from a field,” explains John Lory of the University of Missouri. That means lower fertilizer needs next year, and the opportunity to get credit for it. Lory recently co-authored a report walking farmers through the process of assessing drought impacts on next year’s fertilizer needs and how to calculate nutrient credit potential. Last week’s forward nutrient credit auction for the Susquehanna and Potomac watersheds in Pennsylvania has posted results. The auctions, hosted by the Pennsylvania Infrastructure Investment Authority (PENNVEST) and supported by the Markitplatform, offer credits that can be used to meet nutrient load requirements in the Chesapeake Bay watershed. In this latest round, 18,650 nitrogen credits for 2012 went for $3.17 or $3.18 a pound, while prices for 2012 phosphorus credits were $2.25 or $2.60 per credit. Nitrogen cedits for compliance years 2013-2015 were also auctioned off at $3.18-$3.23 each. The next auction is scheduled for November 7th. – Read a press release. Ecosystem Marketplace, a project of the non-profit Forest Trends, is a comprehensive source of information and analysis on environmental markets and payment schemes for ecosystem services, including carbon sequestration, water quality, and biodiversity. We are seeking a talented individual to manage the launch, operations, and network of partners in our upcoming website for Spanish speakers. Impact Carbon’s mission is to improve health and the environment in developing countries through clean energy projects that reduce carbon emissions. Impact Carbon generates carbon emission reductions from household energy projects that improve living conditions in the less‐developed communities we serve. We leverage the financial returns from these projects to benefit local partners and people. Impact Carbon is seeking a Water Implementation Manager to assist in Impact Carbon’s project operations, administration, and marketing efforts in Uganda. The Water Implementation Manager’s tasks will include working directly with the Impact Carbon Uganda team to set up local assembly and distribution for water treatment products and will report to the Uganda Country Manager. Impact Carbon’s mission is to improve health and the environment in the developing world through clean energy projects that reduce carbon emissions. Impact Carbon generates carbon emission reductions from household energy projects that improve living conditions in the less-developed communities we serve. We leverage the financial returns from these projects to benefit local partners and people. Impact Carbon is seeking a highly motivated Impact Fellow to work on Impact Carbon’s safe water program in East Africa. The position requires strong organizational, project management, and business experience. The ideal candidate will also have knowledge of the Water Sanitation and Hygiene (WASH) Field and strong project management experience. CMI is seeking an outstanding candidate to work on CMI’s stormwater management financing and regenerative agriculture initiatives. This is a two-year position, and the candidate’s time will be split approximately equally between green infrastructure and regenerative agriculture work. Both the stormwater financing and regenerative agriculture projects aim to develop replicable, scalable processes for project implementation. The selected candidate will receive a two-year fellowship with CMI commencing in August 2012. 18 accredited interdisciplinary masterclasses are being held around the UK and Ireland from September 2012 – March 2014. Led by experts in urban green infrastructure design, policy and implementation, these events will explore the local potential to adapt our towns and cities to climate change by working with the grain of nature. Starting in September 2012 in Glasgow, these 18 masterclasses led by UK experts are hosted monthly in key urban centres around the UK and Ireland. Participants explore the potential for urban green infrastructure in the host city, looking at issues of policy, planning, design, installation and maintenance, developing the confidence and skills needed for good practice and implementation. Facilitated by RESET in association with chartered institutions and Defra/DCLG’s Green Infrastructure Partnership, these workshops share knowledge and expertise with local practitioners and designers, planners and policy makers, contractors and green space managers. September 2012 – March 2014. Throughout the UK and Ireland. Managing Forests for Ecosystem Services: Can Spruce Forests Show the Way? The ongoing dialogue around ecosystem services (ES) and their value to society presents forest managers with the major challenge of describing, assessing, and delivering the various benefits that forest ecosystems provide. These benefits will vary with different types of forest ecosystem and the ways in which they are managed. One ecosystem of major importance in the northern Hemisphere comprises those forests dominated by spruce species. Spruces occur in both natural forest systems and plantation forests. Spruce-dominated forests will be examined as a ’model’ system to evaluate concepts capable of application across a much wider range of forest ecosystems. This meeting will enable researchers, practitioners and policymakers to present and discuss findings on how best to translate the concepts promulgated by the Millennium Ecosystem Assessment (MEA) and successor documents into strategic, tactical and operational management regimes that will help adapt forests to meet changes in climate and in societal demands. 8-11 October 2012. Edinburgh, Scotland. In today’s world of constrained resources and limited capital, there is a tremendous need to think creatively and implement smarter models for doing business in the water sector. We are already seeing the impact of new, smarter technologies and innovative project delivery models, but how much further can we go? A 21st century water sector should embrace and reward best practices, and tomorrow’s water leaders must be connected, creative and unafraid to question and improve upon the old paradigms for doing business. The American Water Summit is the foundation for this successful water future. An agenda-defining event with the intimacy and openness of a boardroom meeting, the Summit brings together the leaders from public and private sectors to make connections and lay the groundwork for the future of water. 14-15 November 2012. Chicago IL, USA. Treatment wetlands are now a well established technology. There are several thousand wetland systems treating municipal, agricultural and industrial wastewaters in North America and Europe and a rising number of systems treating point source and non-point source pollution globally. These wetland systems have a wide variety of engineering designs, wetted areas, flow rates, influent and effluent quality, hydraulic properties and monitoring requirements. The information from this operational treatment experience can be used to form design guidelines for wetland systems. Research is necessary in areas of system longevity, pollutant removal process dynamics and system modelling. The major aim of the Conference is to bring together researchers and professionals to discuss new developments and exchange experiences in the field of constructed wetland systems. The Conference will highlight the latest improvements and achievements in the treatment of urban storm water runoff, domestic and municipal wastewaters, agricultural and industrial effluents. 25-29 November 2012. Perth, Australia.